A number of academic disciplines take an interest in understanding the mind. Cognitive science takes into account these varying interests and refers to a multi-disciplinary study of the mind. The cognitive science major is designed to expose students to those disciplines that help us understand and explain the brain and how the mind works. 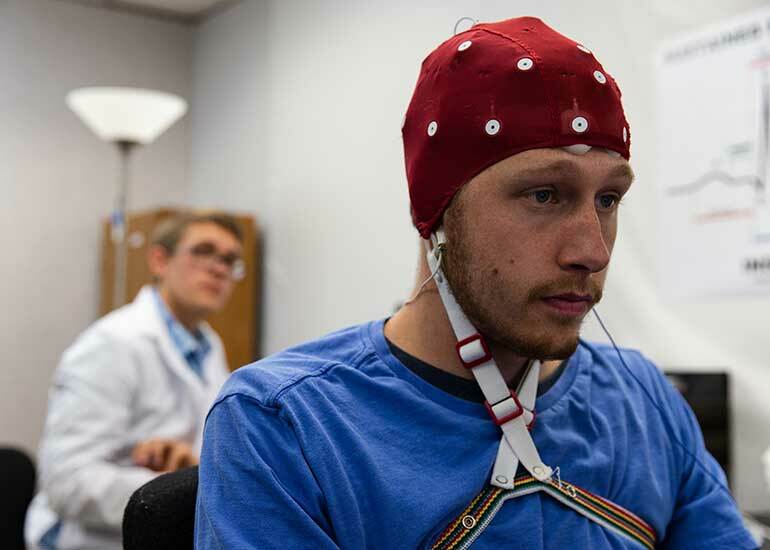 The interdisciplinary major, taught through our psychology department, offers the flexibility to explore the aspect of the mind that most interests you (e.g., psychological, physiological, philosophical, computational). Take courses in neuroscience, the history and systems of psychology, and artificial intelligence. We also offer classes that equip you for research such as computer science, research methods and statistical procedures. The general concentration requires students to take courses in a number of disciplines associated with cognitive science. Therefore, students pursuing the general concentration will take courses in psychology, biology, mathematics, computer science, philosophy and anthropology. After completing this concentration, students will have a broad understanding of how different perspectives can enhance our understanding of the human mind. Neuroscience is a growing field focusing on understanding and resolving health problems that affect millions of people. Professionals in neuroscience often interact with physicians, pharmaceutical executives, and health department officials as they attempt to understand and treat neurological conditions. The neuroscience concentration of the cognitive science major prepares students for this career path. Courses within this concentration are primarily within psychology and biology. Students who complete this concentration will have an excellent understanding of the physiology of the central nervous system, the anatomical structures of the brain, and their corresponding cognitive functions. Attempting to understand the mind raises additional questions about how we solve problems, make decisions, and explain what we know about cognitive processes in a precise manner. The human and artificial intelligence concentration of the cognitive science major examines how cognitive processing can be studied, explained, and simulated using computer science. Courses within this concentration are primarily within psychology and computer science. Students completing this concentration will know how to translate our understanding of the mind into computer applications. Additional career options include clinical neuropsychology, health and rehabilitation psychology, experimental psychology, neurobiology, psychopharmacology, speech pathology and audiology, physical therapy, nursing, computer animation, and database management. Recent George Fox graduates have earned advanced degrees in medicine, audiology, nutrition and law. Request more information about the cognitive science major at George Fox University or schedule a visit to begin your education at Oregon's Christian university, ranked as one of the top Christian colleges in the nation by Forbes. The cognitive science major is perfect preparation for students who plan to go on to graduate programs in cognitive science, neuroscience, educational technology, artificial intelligence, instructional psychology, cognitive psychology, philosophy or cognitive anthropology. Typical employment for recent graduates might be in a technology-related position demanding excellent technical, writing and speaking skills. According to the Bureau of Labor Statistics, employment of medical scientists is projected to grow 13 percent from 2016 to 2026, depending on the area of focus. "The cognitive science program gave me a well-balanced education in the biological and psychological elements of the human mind. I am grateful for my undergraduate education because it provided me with a diverse foundation to understand a variety of elements pertinent to the human experience. This breadth of knowledge has allowed me to pursue my present endeavor, the study of medicine, with great confidence." George Fox is one of the few universities in the Northwest with a cognitive science program, as well as one of a small number of Christian universities in the country to offer this program. Students develop a variety of research and technical skills that are valued by graduate schools and employers. Students engage in learning about the brain and how it works from a biblical worldview. Students enhance their critical thinking skills by exploring how multiple disciplines address a single issue.